Ride country roads of Weston, Lincoln, and Sudbury. The ride crosses the Sudbury River, and there is a delightful stretch along the Cambridge Reservoir. 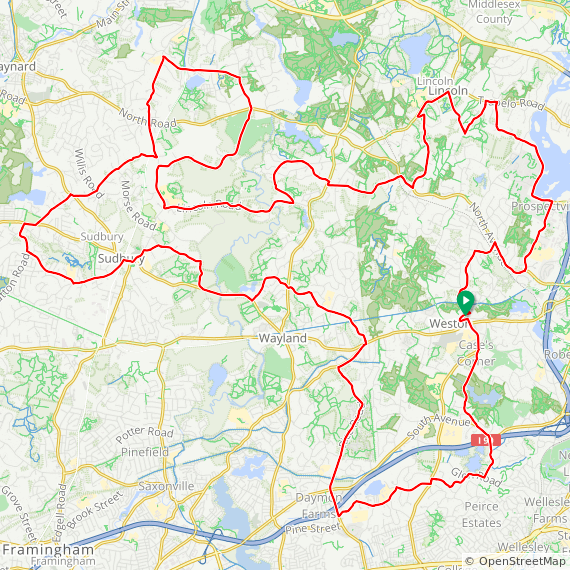 The 45 mile ride extends further into Wayland, Weston and Sudbury. This is not an arrowed ride. Please bring a copy of your ride selected cue sheet if you do not have a GPS. We will meet in front of town hall. Please note the building will be locked so there is no access to the restrooms. Non-members should fill out our release form before the ride. You will then not need to fill out the printed form at the ride. From Rt. 128 take Rt. 20 and head west to the first traffic light. Turn right into Weston Center and park on the far side of the green.